Megamotormadness.com: We pride ourselves on providing top quality ATV, Mopeds/Scooters, Trikes, Street Bikes, Dirt Bikes, UTV, and Electric Motorcycles, variety of accessories and inventory of parts– at very affordable prices. As a licensed and authorized power sports dealer, Megamotormadness has been trying to provide customers with top-class products as well as best customer service, safest & fastest delivery and any possible technical support. Your satisfaction- our number one priority! 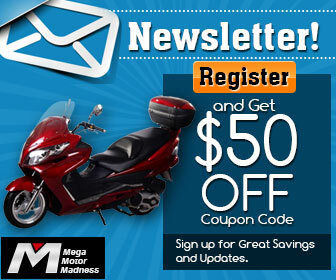 Megamotormadness offers a quick-and-easy online shopping process.